Rafting Trip – Full Day 10am – 4/5pm; 3,4,5 Day Trips (52 mile Wilderness Bridge to Bridge Trip); Overnight trips ; Two Day 10am – 4/5pm the next day; Half Day 10am – 1/2pm; and Custom and Charter Trips. With a variety of trips available, there is pretty much something available for just about all skill levels and age levels. This is a beautiful place to visit and view the vast scenery that nature provides. Book early so that you can get the dates and raft sizes that will suit your group. Description –This Salt River watershed contains approximately 32,100 very rugged acres and was established in 1984. The Salt River and its spectacular canyon bisect the wilderness for its entire length. Elevations range from 2,200 feet at the canyon’s lower end to 4,200 feet on White Ledge Mountain. This area can be visited practically any time; however, there are no maintained trails within the entire wilderness. Travel is basically done by raft or kayak during the short and dangerous river-running season. Mandatory Visitor Permits for river-running are required between March 1 and May 15. River Rating – The Upper Salt River of Arizona rapids are rated class III. Number of Rapids – number of rapids vary with the trip taken depending on half day, full day and multi day trips. Minimum Age – Depending on the flow rate some outfitters will allow children as young as 7 years of age. Departure Dates – Mandatory Visitor Permits for river-running are required between March 1 and May 15. Boat Type – White water rafts suitable for one to 12 people. What to Bring – Temperatures vary quite a bit in the spring time in Arizona, requiring different gear for different days, even hours.Check with your outfitter to confirm what you need to bring. Bring a swimsuit to wear under a wetsuit. Cotton t-shirts, sweatshirts and denim keep you cold once wet and does not belong on the river. Tops and bottoms made of synthetics such as poly-pro, capilene, fleece, silk or wool are designed to keep you warm when wet.Bring or rent wet suit booties, Extra clothing, Sunscreen, Water, Restraining Strap for Glasses, and Waterproof Cameras as needed! Gear required for day trips is much different from what is required on camping trips. Some have car access while others do not. Your outfitter will provide details based on specific trips that you sign up for. 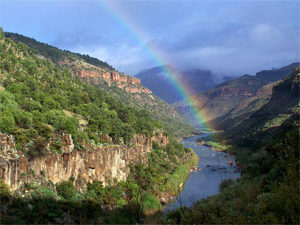 Outfitters – There are numerous outfitters providing white water rafting trips on the Upper Salt River. Check with them directly to book your white water trip.